Car Parks will fill up quickly. If possible, walk or share a car with a neighbour. Parking is allowed on single yellow lines after 6pm. The High Street is closed to traffic from 5pm to 9pm. The full width of the road is needed for the safety of the parade. Security & First Aid – should you need help or see anything untoward, please speak to any Police Officer or Lion marshal who will contact the Lions control centre. First Aiders are also available through the control centre at Bluebird Care in Summers Road. Lost Children or Parents – please speak to a Lion Marshal or Police Officer and meet outside the Lions control centre at Bluebird Care in Summers Road. – Spectators, please remain on the pavement and give the parade space. Santa’s sleigh needs room to manoeuvre safely. – Adults in the parade to be in the centre of the file which should be no more than six people wide with the children on the outside allowing them to see and to be seen. THE PARADE – The Parade this year will assemble at Burnham Park Hall, this will be open from 6.00pm with entertainment for those taking part in the procession. The parade will assemble at 6.50pm outside Burnham Park Hall and leave at 7pm to proceed along the High Street. The parade will be headed by a Dance Group and Santa, in his sleigh, will bring up the rear. The parade will end under the archway (next door to Mulberry Bites) where the children can meet with their parents. Thank you to the businesses there for allowing the use of their car park. SANTA & HIS SLEIGH will, after the Parade, be parked by the archway. ENTERTAINERS will be performing at regular intervals. These include the performers from High Voltage Events, Steel band, Jazz band, The Datchet Morris Dancers and a Barrel Organ. Fairground entertainment is provided by Traylens. CHARITY & GOOD CAUSE STALLS – will be all along the High Street. Stallholders can set up from 5pm. BURNHAM PARK HALL – The Switching on of the Lights will take place at 6:15pm with two pupils from a local School doing the Switch-on. At 8:00pm, Pop Goes the Choir will be performing in Burnham Park Hall for those who want the evening to continue with Friends and Family. This is the 15th consecutive year organising this popular well supported event on behalf of our community brings together everyone to benefit the village of Burnham. I would like to extend my gratitude to all the members of the organisation team, without whom this event would not be possible. Our grateful thanks for Support goes to Burnham Parish Council, The Shanly Foundation, Heart of Bucks, Palmbrokers and Burnham Park Hall. Thanks also go to Bluebird Care and the Police for their help, to High Voltage Events for providing the Entertainers and to all the other local organisations, voluntary groups and individuals who have contributed to make this a wonderful evening. This year we have the theme of Prince & Princess. The children have been very busy getting ready for the Parade and decorating the Burnham Park Hall Christmas Tree. 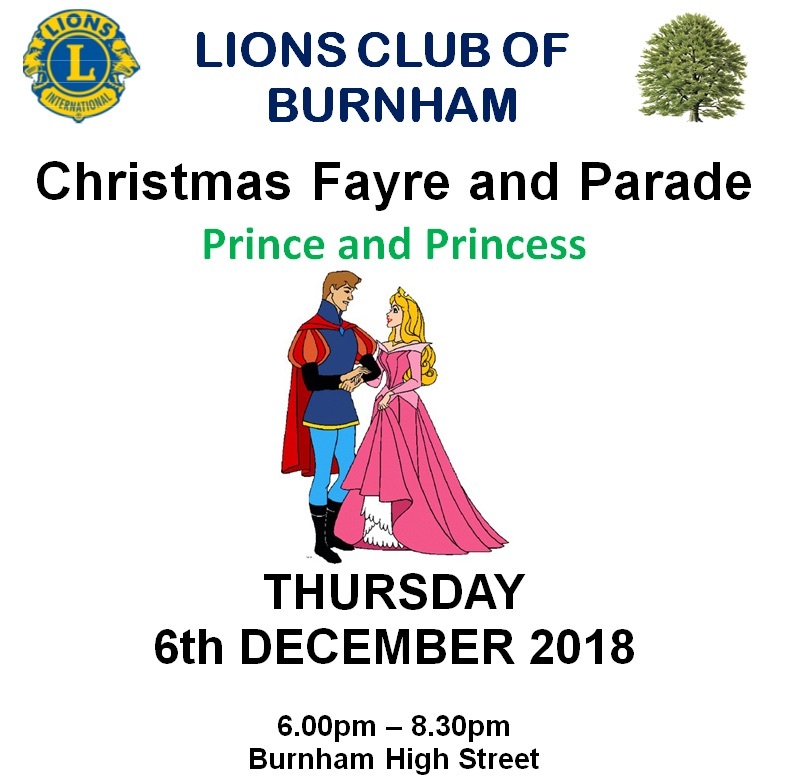 We will have a musical medley including a Choir singing Carols on the Green outside Burnham Park Hall before the Switching on of the Burnham Christmas lights, before the Parade sets off. We expect that this fun filled evening will be enjoyed by all ages whilst giving Charities an opportunity of raising funds at this important time of year. Many of the Shops will also be open, so please support them. Take care and take notice of the Marshals and the Police.